The first lecture at the forum was devoted to the forthcoming publication of the journals of Fr Cyprian (Kern), who served as Chief of the Russian Ecclesiastical Mission in Jerusalem from 1928-1930 (Deacon Alexander Zanemonets, speaker). Fr Cyprian (1899-1960) is renowned mostly for his participation in the “Paris School” of Russian theology, a professor at St Sergius Theological Institute and teacher of Protopriest Alexander Schmemann, Protopriest John Meyendorf and Protopriest Boris Bobrinskoy. Long before his Paris period, while still living in Serbia, the 28-year-old Hieromonk Cyprian was appointed by Metropolitan Anthony (Khrapovitsky) and the Synod of the Russian Orthodox Church Outside of Russia to be the Chief of the Russian Ecclesiastical Mission in Jerusalem. The main fruit of the two-year sojourn of Archimandrite Cyprian in the Holy Land was the preparation of a book on his great predecessor as Chief of the REM, Archimandrite Antony (Kapustin). 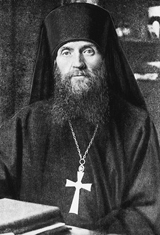 The Mission at the time was headed by Archbishop Anastassy (Gribanovsky), who was living in Jerusalem but later became the First Hierarch of the Russian Church Abroad. The Jerusalem journal of Fr Cyprian (approximately 300 meticulously handwritten pages) was recently discovered, which now bear witness to the inner life of the man in his youth, but also brings testimony about the “Russian Palestine” of the British Mandate period. The life of the Mission and Russian monasteries, along with the Jewish-Palestinian conflict of the time is recorded, as well as the many contacts with the British authorities and the correspondence with the Russian diaspora. Finally, the journal reveals the evolution of Fr Cyprian himself, about whom is little known from this period of his life.